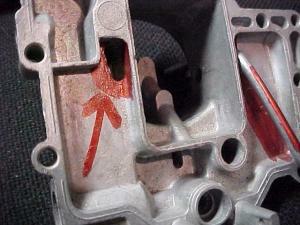 The carburetors stock on all normally aspirated (non-turbo) Corvairs are a variation of Rochestor HV single barrel carb. The 140 HP engines use 4, all the others 2, one per bank. When subjected to high G turns, fuel will slosh out of the stock vents, flooding the engine. The modification Chuck details below will effectively eliminate this flooding. First clean your carburetor tops well with the carburetor cleaner and make sure the existing factory vent holes (one on each side of the carburetor top ) are clean and free of any foreign Matter. Expand the passage size on each side of the carburetor top by using the 3/16 drill bit to remove enough metal to insure that your brake tubing will extend through the passage. You may want to use a little machine oil to insure the drill bit doesn’t “grab” the soft pot metal. USE THE BRAKE PART CLEANER TO FLUSH THE FILINGS AND KEEP THE PROJECT CLEAN OF METAL DEBRIS. IT’S INEXPENSIVE, CLEANS AND DRIES QUICKLY AND LEAVES ALMOST NO RESIDUE.